Much has been made of the iPad’s potential as a stand-in for a laptop whenever you leave the comfort of home and don’t care to tote around a laptop. Two Macworld editors got the chance recently to put that potential into practice. Both Christopher Breen and Jonathan Seff spent last week on the road—the former on a family vacation, and the latter on a business trip. They took their shiny new Apple devices with them, to see how well the iPad fares as a traveling companion compared to Apple’s other portable offerings. Thanks to the predictable annual tilting of the globe that brings about Spring Break in the Northern hemisphere, I had occasion to learn something of just how appropriate the iPad is for travels during a long weekend in Yosemite National Park. My plan was to use the iPad for several tasks: Back-seat entertainment device for my daughter, e-book reader, e-mail grabber, and Web browser. In most respects it rose to the challenge. Where it fell down, it did so in expected (though still frustrating) ways. In the back seat: The drive from our California coastal hamlet to Yosemite Valley is approximately 2381 When-Are-We-Going-to-Get-Theres (or around 5 hours and change). My daughter has terrific powers of concentration, but providing her with just a single iPad diversion would tax even those powers. With that in mind I loaded the iPad’s Videos app with four movies and six Daffy Duck cartoons. 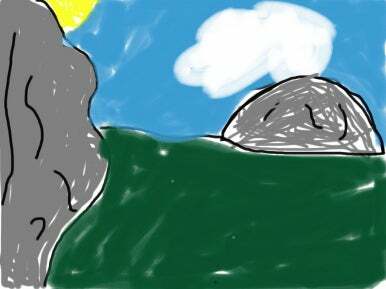 Should she feel the need to create rather than absorb, I made sure that Autodesk’s SketchBook Pro was also installed. And, because she still has the stomach for it in a moving vehicle, something to read. She’s lately been burning through Rick Riordan’s Percy Jackson series and didn’t have the final book—The Last Olympian . We tried to find a copy at the local bookseller, but had no luck. Before leaving I fired up the iPad, launched the iBooks app, and searched for the book. Score one for e-books and the needlessness of worrying about inventory and shelf space. There it was. Sure, at $11 it was a buck-fifty more than a physical copy from Amazon, but it was available now and took next to no time to download. The iPad also served in the front seat. 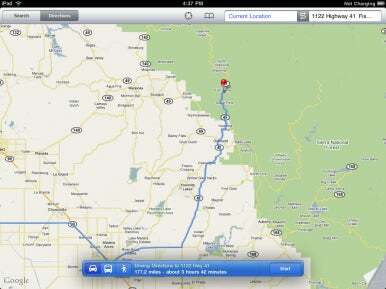 Though I’ve made the Yosemite journey a couple of times, I like having a map at the ready Just In Case. Before we left the house I plotted our route in the iPad’s Maps app so that the list of turns was available to my helpmeet and navigator. She referred to it once or twice and she too was impressed. The iPad can be a help to the designated navigator. The e-book in bed: After the day’s drive, a romp in the snow long enough to remind the family just how damnably wet and cold the stuff can be, and a modest dinner, it was off to bed. Before getting the requisite 40 winks, I like to prop two pillows under my noggin and read a chapter or two of whatever happens to be sitting on the bedside table. As the iPad was in prime position on that very table and I had a not-completely-usuriously-priced Wi-Fi connection, I strolled into the iBooks store and downloaded half-a-dozen free titles prepared by the blessed Project Gutenberg. Even with a download speed of less than a megabit per second, each book downloaded in under a minute. I chose a favorite—P.G. Wodehouse’s Right Ho, Jeeves for the iPad acid test. Holding the iPad in landscape orientation I discovered what many have already reported: Holding an iPad for long periods of time is far different from holding a book. At 1.5 pounds, the iPad is heavier than a paperback book by a goodly amount. And, unlike that paperback, it requires two hands to hold comfortably. I found the best position was to place the iPad’s left corner in the palm of my left hand and make a reverse L shape with the thumb and index finger of my right and rest the right corner in the crook between the two digits. Doing that I could get through a chapter or two before I had to put the iPad down for a rest. I very much appreciated the brightness control. I adjusted it down so the backlighting wouldn’t burn into my eyes. But after awhile I began to wish that the text was a little crisper. Taking care of business: Although I was on vacation, messages from the office continued to appear in my inbox. One, in particular, required my attention. This message contained a PDF attachment of our iPad coverage for Macworld magazine. My iPad as iPod story was part of that coverage. The story’s editor wanted all those who contributed to the piece to read it over and get back to him with suggestions and changes for the print version. I was able to use the iPad’s Quick Look feature to open and read the attachment, but beyond that, nada. I couldn’t copy any text from it nor would Mail allow me to transfer the file to another application that could edit the file. Without the ability to do more than read the article, the reply to my colleague wasn’t terribly helpful. I understand that the iPhone OS 4.0 update will allow you to open e-mail attachments in a separate application. Given my experience, this is a feature I suspect anyone hoping to do serious work with an iPad anxiously awaits. 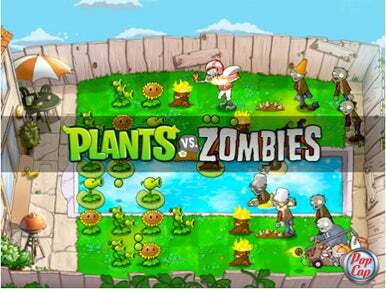 A little Plants Vs. Zombies action on the iPad can help pass the downtime during a family trip. The pass-around iPad: When not taking in the natural glory that is Yosemite Valley (or resting our weary dogs in the aftermath), the family took turns with the iPad. My wife surfed some of her favorite Web sites. My daughter returned time and again to Percy Jackson, took in Duck Dodgers in the 24 1/2th Century , played Plants vs Zombies HD, and dinked around with Smule’s Magic Piano. As I saw the iPad shuttled about I realized that, far more than my MacBook or iPhone, this is a device that begs to be shared—for both good and not-so. The good is obvious—it’s a device just about any family can love for its powers to entertain and inform. The not-so is that you have to be careful about what you put on it. I had to tell my daughter that there were certain applications that she wasn’t allowed to touch. The iPad’s Restrictions feature is fine for restricting media you’ve obtained from the iTunes Store, but I sought a way to bar her from using a particular application. Specifically, the comics I prefer are mature in theme and not for her eyes. Unfortunately, any comics app is an attractant to a kid. I’m lucky to have a child who is of an age where she still listens to her father, but not every child is so mindful. The jailbreak community has produced a way to limit access to third-party apps under the iPhone OS. I hope Apple can do the same. Limits as laptop: Although I was generally satisfied with what the iPad could do, I was also sometimes frustrated by its limitations. I’ve already mentioned my problem with e-mail attachments and the overall difficulty of moving documents between applications. Additionally, I take a lot of pictures when on these kinds of trips and I longed for an iPad camera connector so I could view my pictures on something other than my camera’s LCD. I look forward to Apple’s camera connector kit and am thrilled to the core that it supports RAW files. And I missed a 3G connection. There were times when we were places where there was no Wi-Fi and thus no way to make a connection to the Internet to conduct a short Web search for a bird we’d just spotted or pull up some Ansel Adams images so my daughter could see how Yosemite should really be photographed. Fortunately, this isn’t a limitation I need to live with for long (if I’m willing to trade in the Wi-Fi model for the upcoming 3G version). Unlike crayons, the iPad doesn't melt in the back seat of a hot car. Home again: The drive home was more of the same—Percy Jackson, in the back seat, with a trident; some sketches of Half Dome and El Capitan in SketchBook Pro; and one or two Daffy Duck cartoons. When we pulled into the driveway it was mere minutes before daughter and iPad were on the couch with The Last Olympian and a few hours following that I was perched in bed, the iPad tucked into Apple’s iPad Keyboard Dock, clacking out these words in Pages (and wishing for an iPad-compatible version of BBEdit). After my iPad made its 10,000-plus mile journey to my house—Shenzen, China; Guangzhou, China; Anchorage, Alaska; Louisville, Ky.; Oakland, Calif.; San Francisco—what did I do with it three days later? Hop on a plane and add 2704 miles to its globetrotting ways. To be fair, the business trip was already planned, just fortuitously timed. And I’ll add that I also brought my iPhone and my MacBook with me on the trip. In the airport: I usually get to the airport early and breeze through security, which leaves me extra time to hurry up and wait. But my spare moments at San Francisco International Airport offered an opportunity to play around with my new iPad. 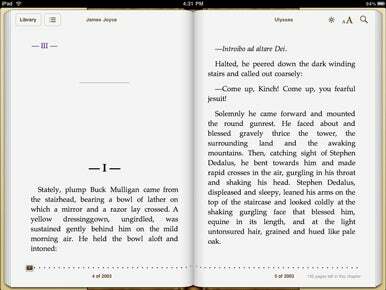 Reading a free version of Ulysses on the iPad. While enjoying a bowl of San Francisco Soup Company’s southwestern corn chowder, I flipped open the cover on the iPad case and began reading a free iBookstore download of James Joyce’s Ulysses in iBooks. (I first read the book almost 15 years ago in a Joyce seminar at UC Berkeley, and even named my cat Molly after the character Molly Bloom.) Although I was slightly more worried about splashing soup on my new iPad than I would have been with a book, reading was pretty enjoyable as the events of June 16, 1904 unfolded. Because of flaky or costly airport Wi-Fi, I would have liked having 3G data access. I ended up pulling out my iPhone in order to check and respond to e-mails that I would have preferred to deal with using the iPad. Up in the air: Once on my flight to Boston, I solved an LA Times crossword puzzle using the $5 KrossPath iPad app, and read a few more “pages” of Ulysses. I then watched two half-hour TV shows (The Daily Show, South Park), an hour-long episode of Stargate Universe, and then almost all of the movie Monsters vs Aliens (I might have finished had it not been for two curious flight attendants asking me about the iPad). After all of that, I still had roughly 70 percent battery life remaining. On the flight home, I listened to some music, and watched three hour-long TV shows (including an episode of Fringe that I purchased from the iTunes Store directly on my iPad earlier in the day) and the entire movie 9 —and still had more than three quarters of my battery remaining. 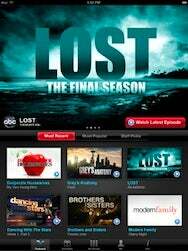 ABC Player lets you keep up to date on your stories, even from the road. During the day: Because I brought a laptop with me on my trip (using Adobe InCopy or working on a document stored in Dropbox are beyond the iPad’s capabilities) I didn’t lug along a Bluetooth keyboard for the iPad. Still, I found composing e-mail much easier on the iPad—especially with the large keyboard in landscape mode—than on the iPhone. I could type much faster and make fewer mistakes that required my attention to correct. If you’re trying to stealthily check your e-mail during a business presentation, say, the iPad larger size makes it a little hard to stay under the radar.